You Can't Get a Good Scan! The 1965 Topps Embossed insert set consists of 72 cards that were once inserted into the regular ’65 series card packages. The cards themselves are relatively tall and skinny, measuring 2 1/8" by 3 1/2". The card fronts feature profile-view player portraits on gold foil. The images are slightly raised, and are often found with scratches and flaws, because the gold foil is so thin and easily damaged. The player portraits can be found on either a blue background (denoting an American League player), or a red background (denoting a National League player). There are various rumors circulating the industry, suggesting that there are 1965 Topps Embossed cards that feature silver foil as opposed to gold. DeansCards.com, like many others, is in the majority that has never seen one of these supposed silver foil cards. If you have any information on these cards, or if you have seen one of these cards personally, feel free to drop us a line and tell us about it! 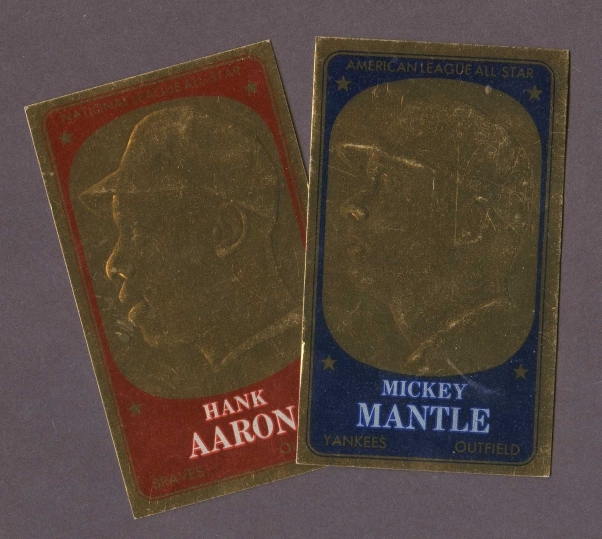 Unlike so many expensive 60's Star Cards, the stars in the '65 Embossed set are actually quite affordable. 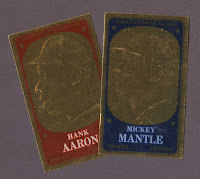 The complete set as well as our DeansCards.com inventory alike, are both filled with 1965 Embossed stars including big names like Mickey Mantle, Roberto Clemente, Hank Aaron, and Willie Mays. We just added a 1965 Topps Embossed Set to our website this morning!